Mining Journal is the industry's leading source of intelligence for global mining investment, finance, and business. A Mining Journal subscription packs news, exclusive interviews, surveys, opinions from various experts and the industry's best columnists, market trend data, financial information and news of business development opportunities into the industry's best website, print edition and exclusive reports. 5 annual reports (valued at £495 each) produced by Mining Journal's Intelligence division, centred on the most relevant discussion points in the mining sector: Risk, Finance, Leadership, Projects and METS. Mining Journal's annual reports analyse data, reader surveys, and interviews to deliver in-depth insight not available anywhere else in the market. 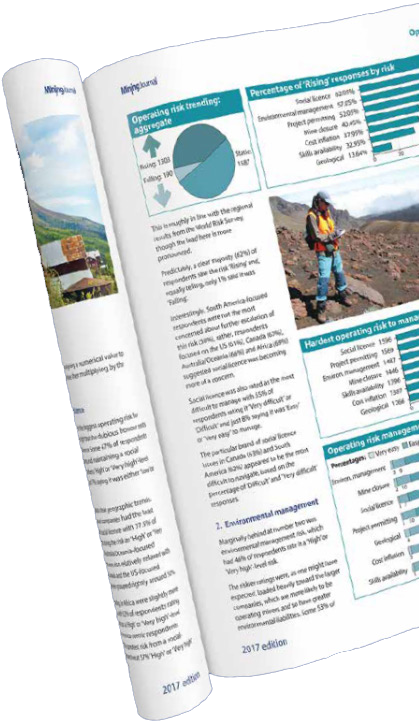 Mining Journal Intelligence delivers 5 annual, independent and impartial reports with a total value of £2,475. The reports focus on Risk, Finance, Leadership, Projects, and METS. Using Mining Journal's established network of industry contacts and readership, each report pulls together data, reader surveys and interviews to deliver in-depth insight. A comprehensive view of mining risk, which includes a jurisdiction-by-jurisdiction ratings system and an assessment of general business and operating risks and trends. Find out more. Executive interviews and professional survey of the industry's readiness to take on the challenges of today, and tomorrow. Find out more. A critical review of mining's key global stock exchanges, the results of our investor sentiment survey; and insights from the alternative financing community. Find out more. A financial review of the METS universe, plus analysis on key trends facing the industry as viewed by leading METS executives. Analysis on key development-stage assets, production likelihood, and the potential impact the current project pipeline on various commodity markets. 5 annual reports (valued at £495 each) produced by Mining Journal's Intelligence division, centred on the most relevant discussion points in the mining sector: Risk, Finance, Leadership, Projects, and METS. Mining Essentials is comprised of a subscription to both Mining Journal and Mining Magazine, providing a 360-degree holistic view of the mining industry. Pair your finance and investment news from Mining Journal, with Mining Magazine, for an operational view on innovations and technology disrupting the industry. 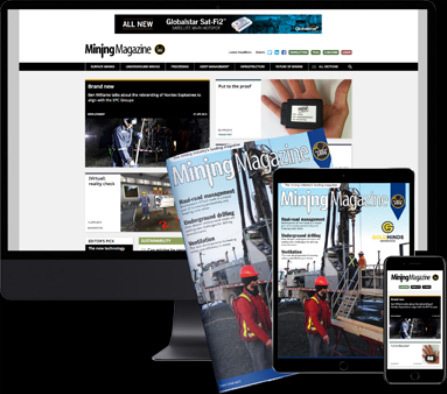 MiningMagazine.com provides the industry's only comprehensive source of breaking news on a daily basis, aimed specifically at keeping mine managers, equipment producers and consultants ahead of their game. See the full picture and make better informed decisions. *VAT (where applicable) will be added to the price quoted above at checkout. Annual report publication dates and topics may be subject to change. Full terms and conditions are available to view here. Request a Digital multi-user subscription for more than 10 users for your organisation. Request a Mining Essentials Digital multi-user subscription for more than 10 users for your organisation.